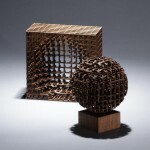 Size: Cube: 7x7x3 1/4, Sphere 5" dia. This work uses the same 3D grid construction technique I first used in 2010 when building “Spherical Aspirations“. 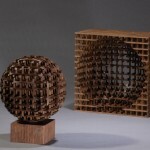 The construction is symmetrical from the center of the cube (or sphere) – the sticks for each axis are grouped into four 7×7 sets in each quadrant of the face. 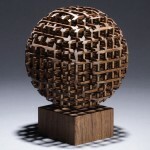 The original inspiration was to create an op-art piece by removing a sphere from within a cube. This time I chose to leave the cube split. The optical effect is much stronger when looking at the split hollowed cube face. 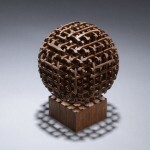 One of the cool things about this piece is that I always end up with grid waste in the shape of a rough sphere. 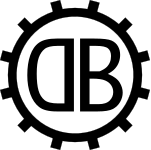 Rather than discard this material, I also build and turn the sphere. When I was nearing completion of this particular work, the two came together on my work bench. 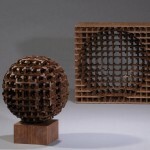 The juxtaposition of the sphere with the half cube creates a tension that causes one to stop and ponder. The whole, the half the positive and negative – what exactly are looking at? 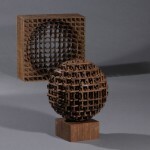 The op-art sphere in the cube easily switches to a positive within the cube, perhaps it’s about to produce another sphere? I decided to present the pieces as a pair. 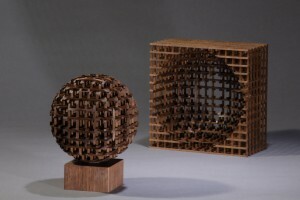 The stand for the sphere references back to the cube. 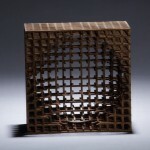 It is the smallest of three geometrical forms and it is solid. All three forms have approximately the same physical volumes but take up progressively large space. These works are incredibly time consuming to make – the reason that this is only my second. Working from 4/4 or thicker stock, I hand mill the matchstick sized sticks (1/8” square) carefully maintaining the orientation of each stick so that they are reassembled in the same orientation and relationship as the original stock. 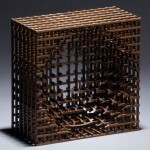 A full cube constructed in this fashion contains 588 individual sticks, 2744 overlapping points (where 3 sticks meet) bringing the total number of glued faces to 8232. The title “My Better Half” has multiple meanings. The cube is only a half cube, the other half didn’t turn out as well. The wax process that I use to turn these makes my kitchen smell like a candle factory, fortunately my wife Rosanne is very tolerant. Finally, I feel that I am forced to split my creative energy between engineering and art, I believe that art is my better half.